Jessica (second from right) with CFA volunteers (from left) Perry Carter, Sam Livesay and Vicki White. 179036_01. Picture: Rob Carew. As CFA volunteers across the Yarra Valley head out on Good Friday, rattling tins for the Royal Children’s Hospital Good Friday Appeal, Jessica Curgenven could well be their inspiration. The 24-year-old Hillcrest CFA volunteer is living proof of the good work done at the hospital and of the resilience and heart that proves itself so often in CFA volunteers of all ages. Jessica’s story began when she was nine, when the disease she was born with, Congenital Fibre Disproportion, was diagnosed. An extremely rare disease, it comes under the same umbrella as muscular dystrophy and was only picked up with a muscle biopsy, the first of many, many treatments at the Royal Children’s Hospital. She was subsequently disagnosed with a heart condition – mitral valve prolapse, but says she is ‘lucky’ with that one which is currently managed with medication. What had even more serious consequences came at 13 when it was discovered that she had some scoliosis in the spine. The decision to have surgery to fuse her spine was a hard one, but one she says was in some ways was hardly a decision at all. “What they told us was that if I didn’t have it I would die,” she explained. With compromised lungs, the anaesthetic was a concern, and overall the risk against a successful outcome was incredibly high. Throughout it all, her mother, Vicki, has been her rock. “She has pretty much kept me alive; fought for me. I wouldn’t be here now without her by my side through all of this,” Jessica said. She has had the same support from her Nan and Pop, and says her GPs have also been great supports through what has, and is an ongoing, challenging journey. For over a decade, the Royal Children’s Hospital has been like a second home and despite the circumstances, and the pain, she reflects positively about her association with the world-class hospital that she says saved her life, and the amazing role that doctors and nurses play in that. “I was at the old Children’s … back in the old days, and I knew it like the back of my hand, I was in there so often,” she says. Joining the CFA has been a high point where, despite her limitations, she makes a valuable contribution, as she says “behind the scenes” in administration and fundraising. “I do what I can and to the best of my ability and try not to allow it to limit me too much,” she said. “It’s great to be part of something like CFA and it’s something I’ve never really had before. Her message to the communities of Woori Yallock, Launching Place and Don Valley, and in fact to all communities as their local CFA volunteers get out in the streets on Good Friday, is to give whatever you can. “Whether it’s a dollar or 50 dollars, no amount is too small or too big,” she said. 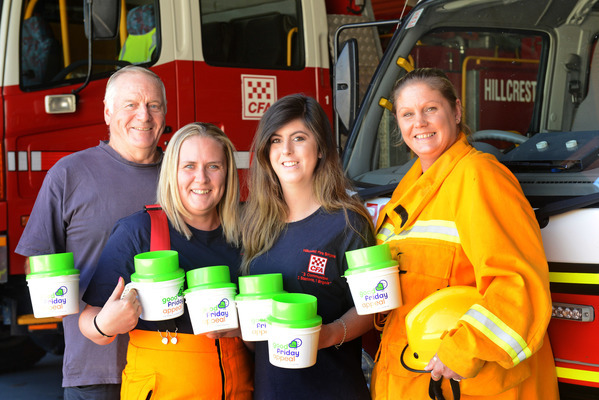 Local CFA area manager for the Good Friday Appeal, Hillcrest CFA volunteer Samantha Livesay, said Jessica was a great ambassador for what all CFA volunteers will be working for this coming Friday. Along with the regular volunteers, the Hoddles Creek CFA juniors will be helping out at Hillcrest and Warburton. As Jessica says … “Give whatever you can … it’s going to help small kids, big kids, doctors, families … everyone. “It really does save lives. I know lots of people who would not be here today, including me.